CAR magazine reader Ben Graham-Evans got more than he bargained for when he drove back south from a business meeting in Manchester - he was overtaken by the new Bentley Bentayga SUV running loose on the M6 motorway. It was one of three Bentleys being driven in convoy on a recent Sunday morning and Ben had the presence of mind to spot the lightly disguised crossover lurking in the middle of the pack. His spyshots provide a good look at the 4x4; there's plentiful camo around the lamps, but you can see the typical Bentley oval exhaust pipes, Continental-style quad circular headlamps and a heavily contoured bonnet. Crewe has only shown the EXP9 F concept car to date, but is due to show the finished production SUV later in 2015 before sales start in 2016. Expect the 6.0-litre W12 to be offered; the prototype Ben saw was a W12, tipped to be capable of 200mph. Bentley recently confirmed the badge of the 4x4: Bentayga, named after a mountain peak in the Canary Islands. 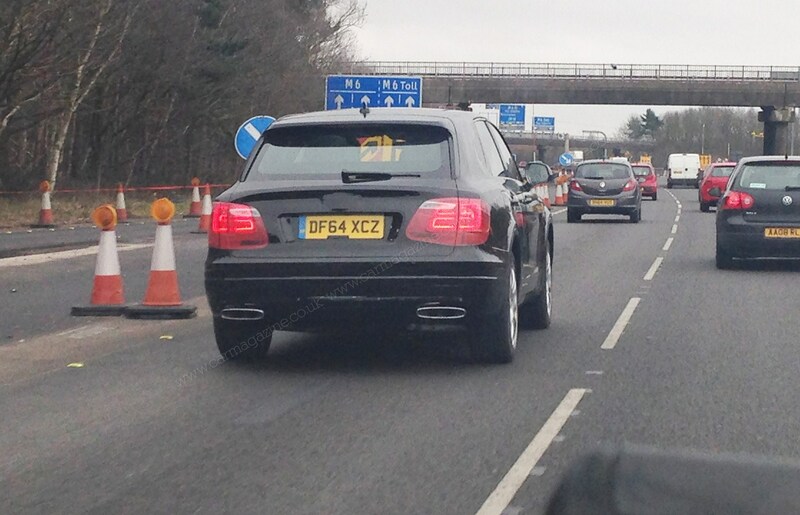 Ben, from Hampshire, was in a BMW X5 when he spotted the Bentley posh-roader whizz past near Birmingham. Handy for providing a sense of scale. 'We were heading down the M6 after meetings in Manchester and saw a trio of Bentleys being driven fast in convoy on an early Sunday morning, including this strangely familiar SUV,' he tells us. The third shot in Ben's scoop has an interesting detail: it's listing over so far that we can only conclude that it's flexing all 600 ponies as it escapes our ad-lib paparazzo or its suspension is a bit wonky! Remember you can send us your own spy pictures for inclusion in Your Spyshots. Follow the instructions here!